The Reichelt Oral History Collection in FSU Special Collections and Archives is a rich and unique collection of over 2,100 oral history interviews and transcripts created throughout 1969-2014. The Reichelt Oral History Program was created under Dr. Edward F. Keuchel and University President D’Alamberte in 1969 with the help of a generous endowment by Wallace Ward Reichelt. In 1996, Dr. Robin J. Sellers undertook the directorship of the program. In 1998, the Program expanded to include oral histories of veterans in various military conflicts. These interviews offer rich historical insight into various subjects including but not limited to FSU/FSCW history, Tallahassee and Florida history, the Florida Highway Patrol, World War II, the Vietnam War, and the Korean War. After the departure of Dr. Robin J. 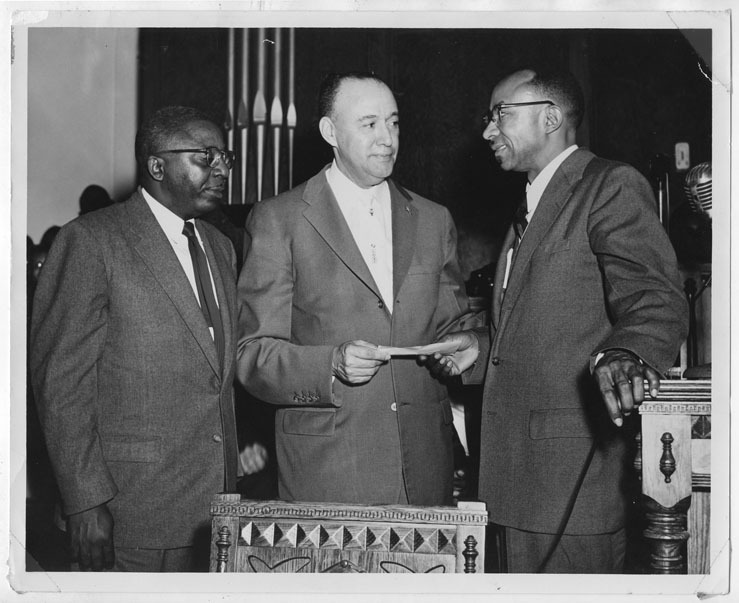 Sellers, the Director and Archivist of the Reichelt Oral History Program from FSU in 2014, FSU Libraries undertook the preservation of their oral history collection. Happy 119th birthday to John MacKay Shaw, founder of our Childhood in Poetry book collection and bibliophile extraordinaire. To celebrate Mr. Shaw, and in our ongoing commemoration of 400 Years of Shakespeare, we present a Scope and Content Note for John Shaw’s papers in the style of title pages from the early hand-press era. Mr. Shaw would surely appreciate our gesture, as the Shaw rare book collection feature works by Shakespeare along with many, many other authors. 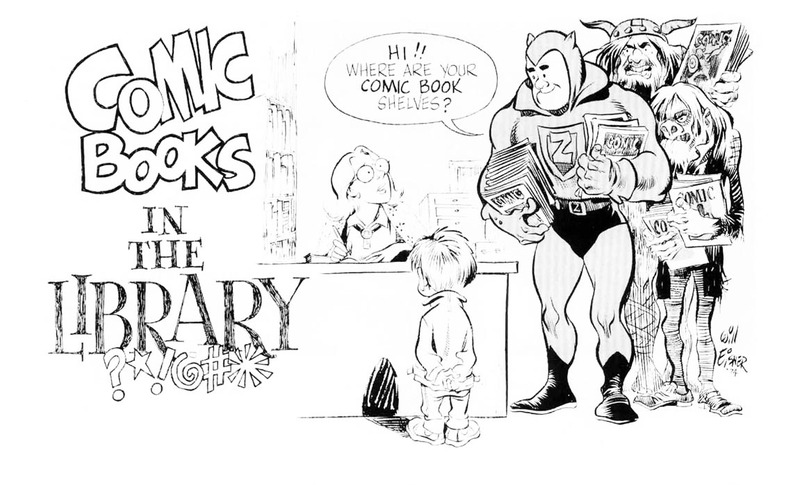 Illustration by Will Eisner. From the School Library Journal, Volume 21, Issue 2. In 1952, the International Council of Scientific Unions proposed an International Geophysical Year (IGY) (which was actually the 18 months from July 1957-December 1958). Members of the global scientific community would coordinate their efforts in order to enhance human understanding of the Earth. Special attention was to be given to the Antarctic continent, for which comprehensive data did not exist. To this end, twelve nations established 36 scientific stations on the Antarctic Ice Shelf in the years leading up to the IGY. Little America V was one of six bases established by the United States during this time. (Four previous bases named Little America had existed in other locations on the continent, but had been discontinued.) Logistical support for the base was delegated to the US Navy by the US Department of Defense, as Navy seaplanes had already been operating on the Antarctic continent for decades; Navy forces under Admiral Richard E. Byrd had been essential to the establishment of previous US research facilities there. 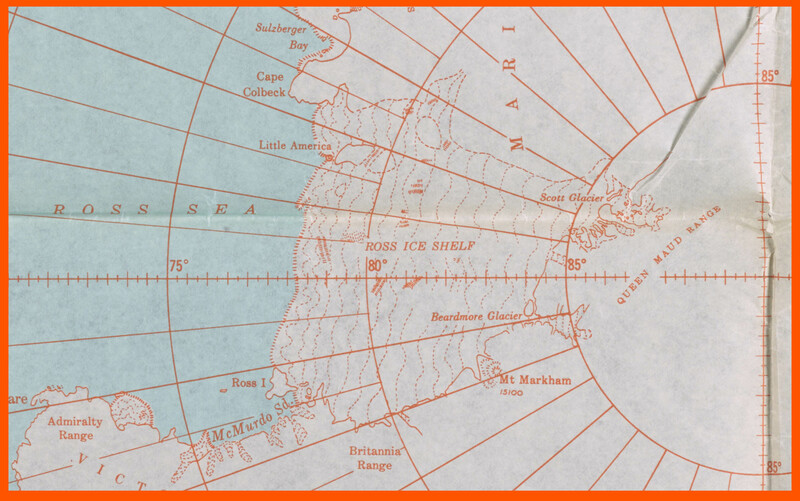 Detail of a 1955 US Navy map of Antarctica, showing the Ross Ice Shelf and the base at Little America. At the far right, lines of longitude converge at the South Pole. From the Robert E. Hancock Antarctic Collection. The resulting Navy mission, Operation Deep Freeze, was planned in two phases, to avoid flying during the punishing Antarctic winter. Deep Freeze I ran during the 1955-1956 austral summer, delivering equipment necessary to outfit the six research bases. Lieutenant Commander Robert E. Hancock Jr. was a supply officer with the US Navy, and spent much of 1957 on the Ross Ice Shelf as a result of Deep Freeze II, which ran further supplies to Little America V and other bases from October 1956 to February 1957. Hancock brought many souvenirs back from Antarctica, including photographs, Navy-issue maps and survival guides, schematics of Little America V, and coal from the volcano at Mt. Erebus. 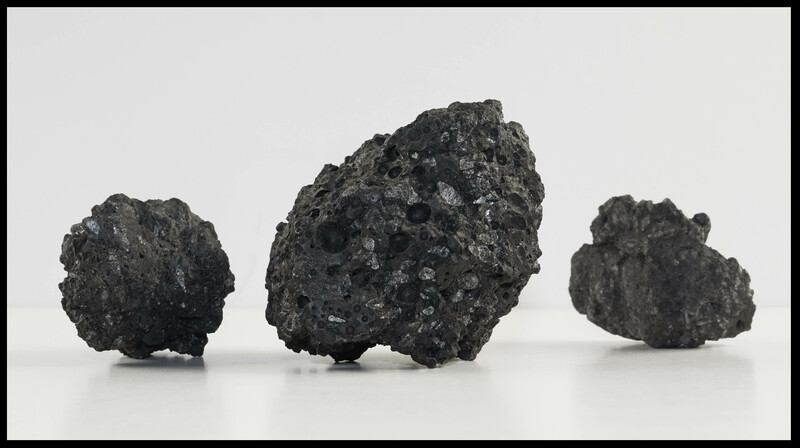 Samples of coal collected near Mt. Erebus, Antarctica. From the Robert E. Hancock Antarctic Collection. Later in life, Hancock collected other artifacts related to Antarctic exploration, including model ships and aircraft, an empty can of cocoa from one of Captain Robert Scott’s expeditions, even ceramic and glass penguins. All of these items and more now reside in FSU Libraries Special Collections and Archives as the Robert E. Hancock Jr. Antarctic Collection, and are open to all researchers from the FSU community and general public. 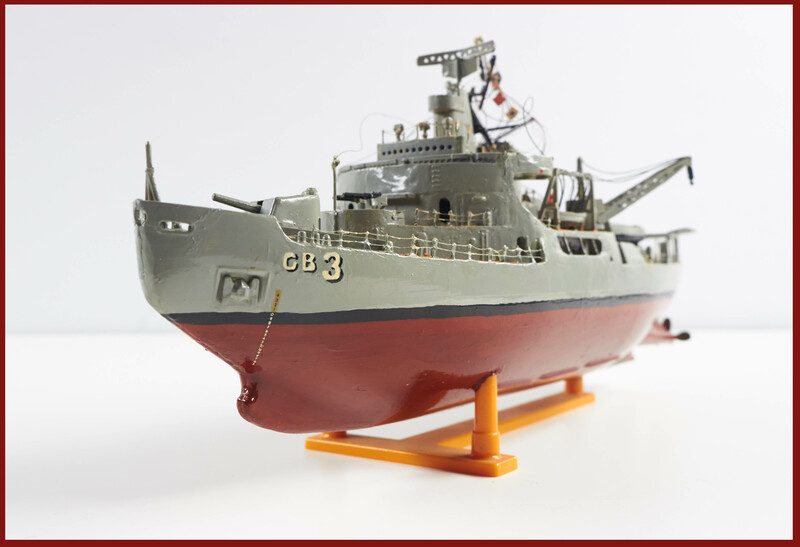 Model ship customized to resemble the USS Atka, which served in Antarctica during the IGY. From the Robert E. Hancock Antarctic Collection. Operation Deep Freeze and the International Geophysical Year each had lasting impact on the global community. Cooperation among international scientists in Antarctica laid the foundation for the Antarctic Treaty of 1959, which still guarantees that no single country will claim territorial sovereignty over the Antarctic continent. The IGY saw the first scientific satellite launches by the United States and Soviet Union, and thus the birth of the “space race” that led to the creation of NASA and the multiple agencies of the Soviet space program. Deep Freeze has continued far beyond its initial two phases in 1955 and 1956, and today, under the command of the US Air Force, still services military and civilian bases across Antarctica. 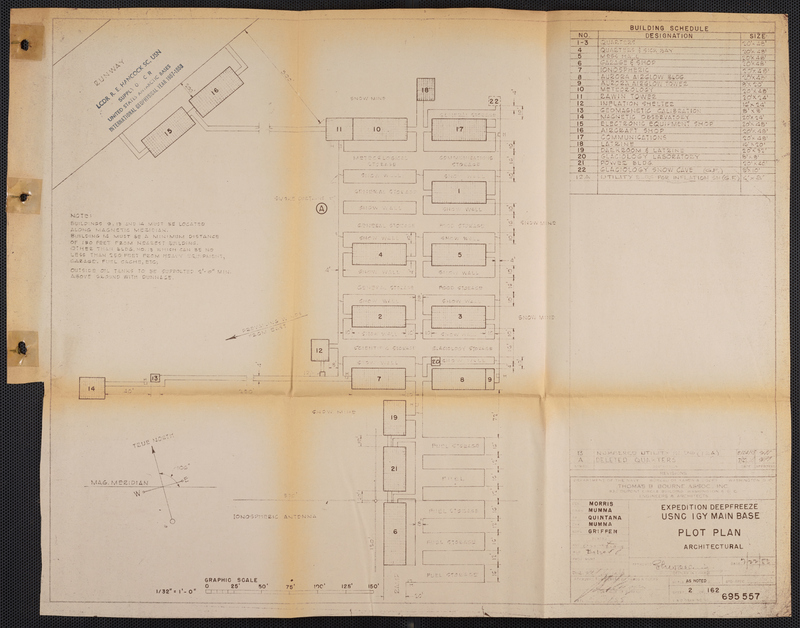 Architectural plot of Little America V. From the Robert E. Hancock Antarctic Collection. Robert E. Hancock, Jr. Antarctic Collection, Special Collections, Florida State University Libraries, Tallahassee, Florida. National Oceanic & Atmospheric Administration. “IGY History: International Geophysical Year.” Accessed December 3, 2015. Ellery D. Wallwork & Kathryn A. Wilcoxson. Operation Deep Freeze: 50 Years of US Air Force Airlift in Antarctica, 1956-2006. Scott Air Force Base, Illinois: Office of History, Air Mobility Command, 2006. The political causes and effects of war are well-documented by scholars and politicians, but the details of life during wartime are the provenance of the fighters on the ground, in the air, and at sea. Throughout recorded time, soldiers have shared their stories, told with humor, pathos, hope, and pride. In honor of Veterans Day, library staff have assembled a new exhibit, “War Stories,” featuring veterans’ experiences in their own words from across 2,000 years of human history. What do archivists do all day, anyway? Look at old photos? Dust yearbooks? Take papers from one file folder and put them in another? 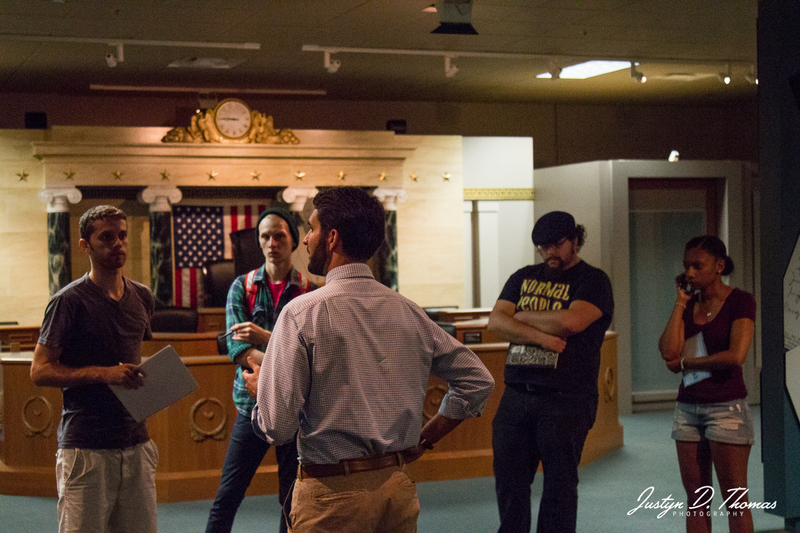 Students from the ART5928 workshop “Creating Experiences” visit the Claude Pepper Museum. Their project this semester involves creating a public event that could be held in in a museum space. The students have designed a Claude Pepper Pajama Party event and social media campaign, and today they’re walking through their ideas with Pepper Library Manager Rob Rubero. Rob Rubero with ART5928 students in the Claude Pepper Museum. (c) 2015 Justyn D. Thomas Photography. Used with permission. FSU Special Collections has always considered local history one of its collecting strengths. 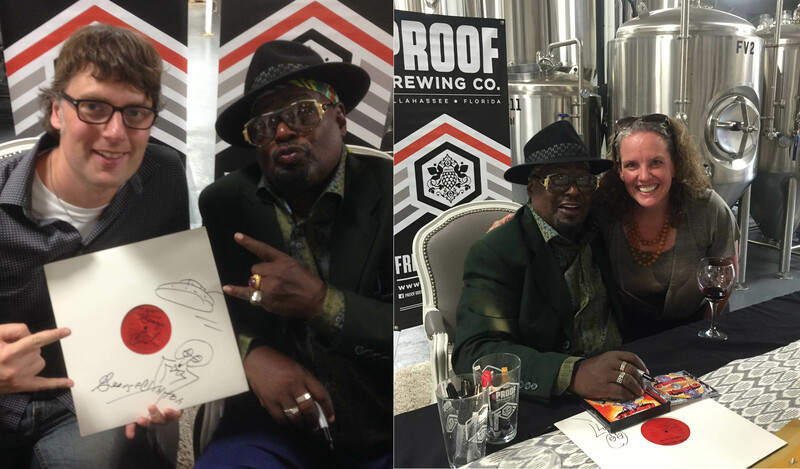 In an effort to deepen community connections and learn more about the Tallahassee music industry, Rory Grennan and Katie McCormick attend a public appearance by influential songwriter and producer George Clinton. Aside from smiles and photo opportunities, our archivists enjoy many conversations with Clinton’s family and associates about his work and his legacy. Rory Grennan and Katie McCormick enjoy photo opportunities with songwriter and producer George Clinton. Today, the Special Collections Research Center reading room has the privilege of hosting the members of the Florida State University History Club. A dozen history undergraduates attend an informational presentation by Manuscript Archivist Rory Grennan and Rare Books Librarian Kat Hoarn. 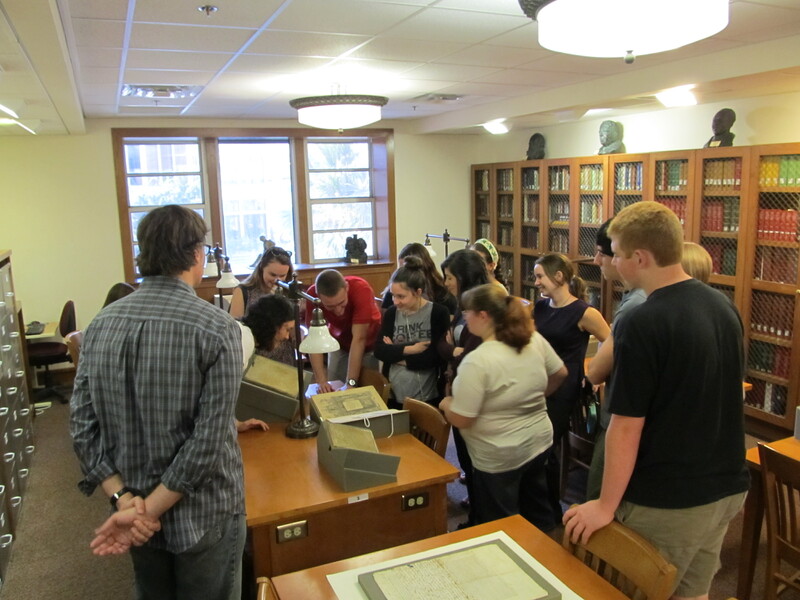 Presentations and instructional sessions for students, faculty, and the public are a core part of the Special Collections mission, and occur frequently at the beginning of the school year. History Club members are excited to see 4000 years of human history laid out in documents from our collections including cuneiform tablets, a page from a Bible printed by Gutenberg, and artist books from the 21st century. Rory Grennan looks on as Kat Hoarn closely examines an illustration by Theodore de Bry with members of the FSU History Club. Monday morning, archivists Sandra Varry and Krystal Thomas visit the University Registrar’s office to consult on the preservation of student transcripts on microfilm. The filmed student records see heavy use, and unfortunately enough of the film has been worn down that some records are losing information. The group discusses modern strategies such as digitization to preserve these essential historical records that document a century of higher education. Later, Sandra Varry and division staff prepare for a new exhibit opening today in the Special Collections Exhibit Room on the first floor of Strozier Library. “Mittan: A Retrospective” celebrates the work of photographer Barry Mittan, and documents student life at FSU in the 1960s and 1970s. The exhibit was curated by graduate assistant Britt Boler and runs through January 2016. Exhibit title card at gallery entrance; Sandra Varry adjusts a framed print in the exhibit room. In the afternoon, Krystal Thomas carefully reviews and uploads recently-digitized cookbooks and herbals to the FSU Digital Library. The Digital Library features digitized versions of the highlights of our collections, as chosen by Special Collections staff and our users, and new content is added regularly by archives staff. Things They Don’t Teach You In Grad School #47: Water and vinegar makes an effective, non-abrasive cleaner for a headstone. Former FSU faculty member Paul Dirac was a giant in the fields of mathematics and quantum mechanics, and his papers are a frequently-consulted resource by researchers at FSU Libraries. Since no members of the Dirac family remain in Tallahassee, it has become the unofficial duty of our library and archives staff to visit Dirac’s grave once a year and see that it is kept clean. October 20th is the anniversary of Dirac’s death, and seems an appropriate time to visit the site. Archivists Katie McCormick, Rory Grennan, and Krystal Thomas, accompanied by library Director of Development Susan Contente and a handful of Physics Department students, scrub the headstone and plant fresh flowers this afternoon. 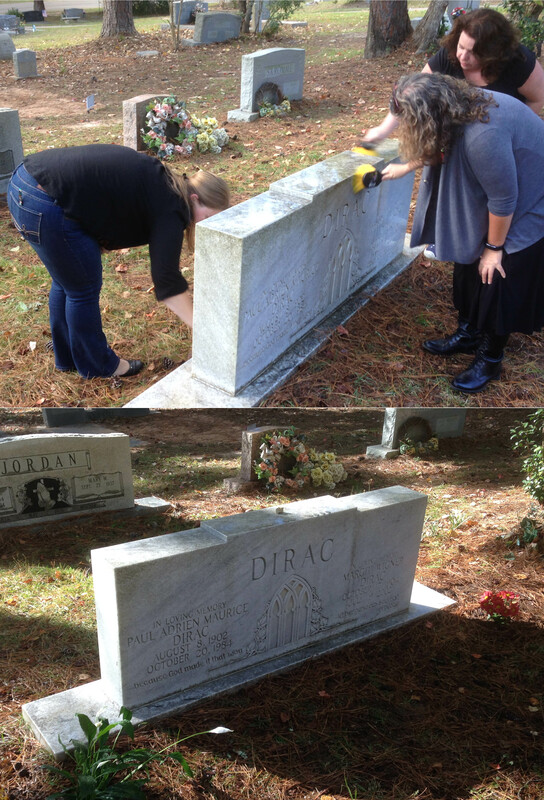 Before: Krystal Thomas, Katie McCormick, and Susan Contente remove grime from the headstone of Paul and Margit Dirac. After: A clean headstone with fresh flowers planted on either side. 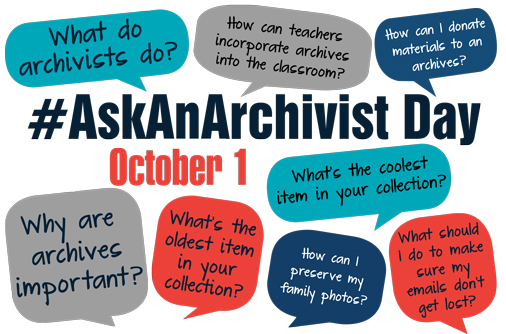 October 1, 2015 is #AskAnArchivist Day! Archivists around the country, including those in FSU Libraries Special Collections, will take to Twitter to answer your questions about any and all things archival. The day-long event, sponsored by the Society of American Archivists, will give you the opportunity to connect directly with archivists at FSU—and around the country—to ask questions, get information, or just satisfy your curiosity. Archivists participating in #AskAnArchivist Day are eager to respond to any and all questions you have about archives and archival work. No question is too casual . . .
What’s your favorite thing you’ve come across in your collections?
. . . or too practical! How do you decide which donated items to keep? How can I get my students more interested in using archives for projects? #AskAnArchivist Day is open to everyone—all you need is a Twitter account. To participate, just tweet a question and include the hashtag #AskAnArchivist in your tweet. Your question will be seen instantly by archivists around the country who are standing by to respond directly to you. 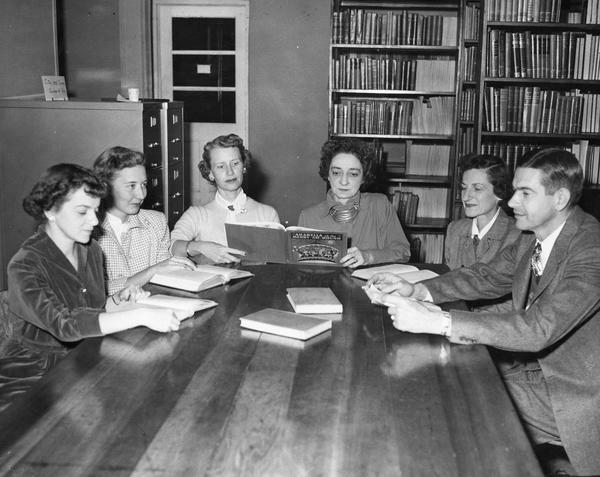 Have a question specifically for FSU Special Collections ?Include @FSULibrary with your question. We will be answering questions live on Twitter from 10 am to 2 pm on October 1st; questions we don’t get to will be saved and answered on this blog next week. Don’t have a question? Use the #AskAnArchivist hashtag to follow the action! Search Twitter for #AskAnArchivist and follow along as questions and answers are shared. Get those questions ready, and we’ll see you on Twitter! Conferences: the original social media.